The Rural Social Scheme (RSS) is aimed at low-income farmers and fishermen/women. The scheme provides opportunities and income supplements to participants. In return, participants on the RSS scheme provide services that benefit rural communities. What type of work do participants carry out? You work 19.5 hours per week. These hours are based on a farmer/fisher-friendly schedule. This is to ensure participation on the scheme does not affect your farming/fishing activities. If you get a place on the Scheme, you are offered a contract from your start date up to the following 31 March. You may be considered for a further term following the initial contract, if you continue to meet all the criteria for the Scheme. The local management decides on your application. Since 1 February 2017, the time limit for participation for new entrants to the scheme will not exceed 6 years. If you are eligible for the Scheme but don’t wish to participate, your dependent spouse, civil partner, cohabitant, sibling or children may take the available place. Am I eligible for the Rural Social Scheme? The Rural Social Scheme provides a supplementary income for low-income farmers and fishermen/women who are unable to earn an adequate living. Note that since 1 January 2016, Jobseeker's Benefit (if you had previously been on Community Employment or the Rural Social Scheme within the last 12 months) is no longer a qualifying payment for RSS. If you are getting JB you can apply for Farm Assist or Jobseeker's Allowance, which are qualifying payments for RSS. What is the criteria to apply? You must provide proof that you are actively farming. To do this, you must provide a copy of your application for the Basic Payment Scheme for the current year, including a valid herd number. If you are actively farming and have not applied for the Basic Payment Scheme, you should contact your local RSS implementing body for advice. 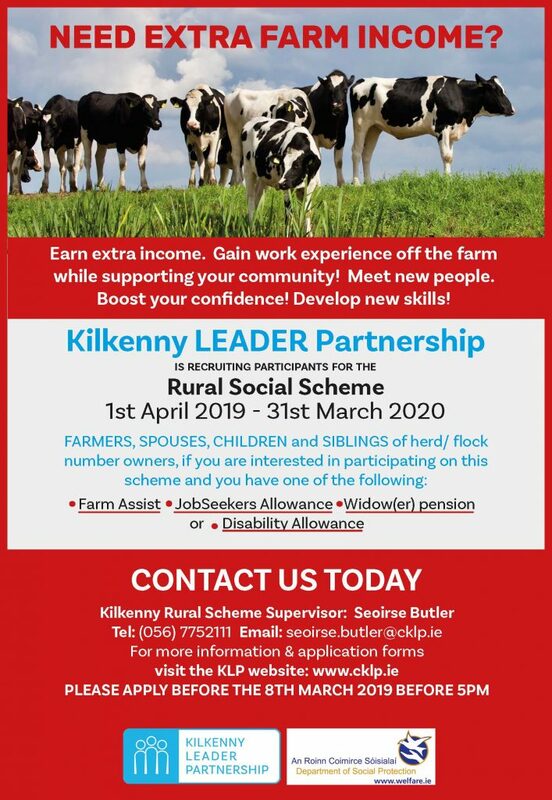 If you are a child/sibling of a herd number owner and you can certify that you are resident and/or working on the farm and you are getting one of the qualifying social welfare payments, you may be eligible to participate in the RSS on the basis of your parent’s/sibling’s herd number. If you are eligible but do not wish to participate in the RSS, your dependent spouse, civil partner or cohabitant can take the available place. Alternatively, if your spouse, civil partner or cohabitant is getting one of the qualifying social welfare payments and is actively farming, they can use your herd number to qualify for the scheme. Your spouse, civil partner or cohabitant can participate in the RSS, if he/she is under 66 and you are getting a State Pension (Non-Contributory) which includes an Increase for Qualified Adult for him or her. The rates of payment for new participants on the RSS depends on your qualifying DEASP payment. The minimum weekly payment increased to €220.50 from March 2018. From March 2018, if the actual social welfare payment (including dependants) you were getting was €198 a week or less, then you will get the minimum RSS weekly rate of €220.50 (that is €198 plus €22.50). If your actual weekly social welfare payment (including dependants) was €198.01 or more, then you will get the equivalent rate plus €22.50. If you were getting an age-related reduced rate of payment your payment is increased to the minimum weekly rate of €220.50. Jobseeker's Allowance or Farm Assist Equal to your current rate of payment plus €22.50 top-up. Minimum weekly payment of €220.50. One-Parent Family Payment Equal to your current rate of payment plus €22.50 top-up. Minimum weekly payment of €220.50. Disability Allowance Equal to your current rate of payment plus €22.50 top-up. Minimum weekly payment of €220.50. Widow's, Widower's or Surviving Civil Partner's Contributory Pension You continue to receive your pension with a top-up of €22.50. Widow's, Widower's or Surviving Civil Partner's Non-Contributory Pension You continue to receive your pension with a top-up of €22.50 (The minimum combined payment is €220.50). Qualified Adult on a State Pension (Non-Contributory) Your spouse will continue to receive the Increase for a Qualified Adult (IQA). Your rate on the RSS will be the difference between your IQA payment and €220.50. A Class A PRSI contribution is paid on behalf of all RSS participants. You are not liable for the Universal Social Charge (USC) on your RSS payment. Your income is liable for tax although it is likely you will pay little or no tax. Find out more about tax. If you are getting other social welfare payments you should check with your Intreo Centre or Social Welfare Branch Office to find out whether they will be affected. You can retain your medical card while you are taking part in the Rural Social Scheme. The rules that apply to your original social welfare payment also apply to your RSS payment. This means that, if your dependant gets a job, their income will be assessed as means and your RSS payment may be reduced. Your RSS payment cannot be reduced below the minimum rate of €215.50. To avoid any possible overpayments, if there is any change in your circumstances, you should inform your local RSS implementing body. Join the Rural Social Scheme Facebook Page to keep up with the latest news. Applications are now being sought from new and existing Community/Voluntary groups who wish to avail of the scheme. In order to secure participants for the coming year(1st April 2019 to the 31st March 2020) groups are now requested to submit application forms/work plans for the above period.